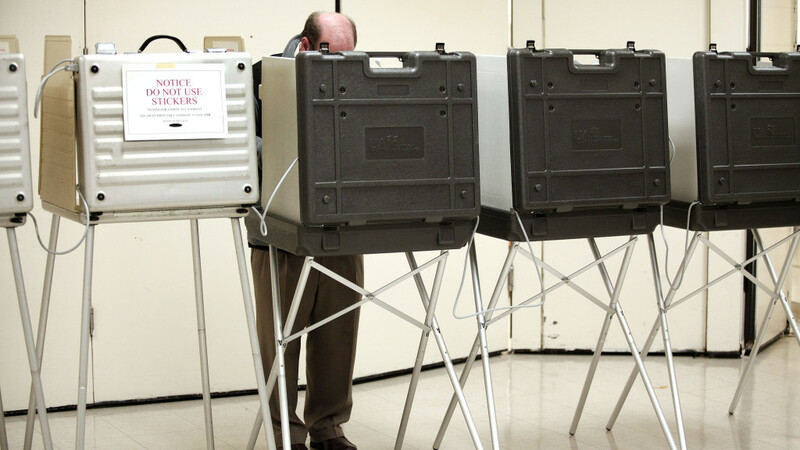 A man casting his ballot. Photo via CBS News. Democratic incumbent Bill Nelson says he’s getting ready for a recount in his race against Republican Gov. Rick Scott. Nelson’s campaign put out a statement on Wednesday saying the rece remains tight and Scott prematurely claimed victory. Under Florida law, there is an automatic recount if the margin is one-half of one percent or less. Scott leads Nelson by slightly more than 30,000 votes out of more than 8.1 million votes cast. Scott spokesman Chris Hartline criticized Nelson for pushing for a recount, calling it a “sad way” for him to end his political career. Scott’s lead in the Tuesday race is 38,717 votes out of more than 8 million cast – a margin of less than one half of 1 percent. Under state law in Florida, a recount is mandatory if the winning candidate’s margin is less than 0.5 percentage points. Scott told supporters gathered in Naples that the election against incumbent U.S. Sen. Bill Nelson had been “divisive and tough” but he vowed to change the direction of Washington, D.C.
DeSantis promised to keep the state’s taxes low and protect taxpayer dollars. He also promised to protect Florida’s environment by stopping red tides and restoring the Everglades. The Tallahassee mayor had sought to become the state’s first black governor and the first Democrat to win the governor’s race in more than 20 years. Republican Chief Financial Officer Jimmy Patronis will keep his job in Florida’s Cabinet. Patronis defeated former Democratic Sen. Jeremy Ring in Tuesday’s election. He was appointed by Republican Gov. Rick Scott to fill the remainder of Republican Jeff Atwater’s term. Democrat Andrew Gillum has conceded Florida governor’s race to Republican former U.S. Rep. Ron DeSantis. The Associated Press has not called the race. The Tallahassee mayor had sought to energize his party’s voters as an unabashed liberal. DeSantis had hoped to ride President Donald Trump’s backing to victory. Voters on Tuesday approved Amendment 6. The measure gives victims and their families a right to due process, speedy proceedings and to have their welfare considered when a suspect’s bail is set. It also increases the mandatory retirement age for judges to 75 instead of 70. The American Civil Liberties Union and other opponents said the measure was not needed, that victims already had equal rights with defendants in Florida. They said the measure will interfere with a defendant’s right to a fair trial. Florida voters have approved a measure adding two new state agencies, setting the Legislature’s start date in even years and requiring counties to have and elect certain offices. Voters on Tuesday approved Amendment 10, which requires the state to create an Office of Domestic Security and Counter-Terrorism and maintain a Department of Veterans Affairs, which already exists. The measure also dictates that university fees other than tuition cannot be increased without super-majority votes from both the schools’ board of trustees and the state’s board of governors. Mucarsel-Powell is originally from Ecuador. She sought to tie Curbelo closely to policies of President Donald Trump seen as unpopular in the district. She also stressed addressing gun violence with ads about her father’s shooting death. Republican Ashley Moody will be Florida’s next attorney general. Moody defeated Democratic state Sen. Sean Shaw in Tuesday’s election. Moody is a former judge and federal prosecutor from the Tampa area. During the campaign she pointed out that Shaw had never prosecuted a case and that his first shouldn’t be as attorney general. Moody is a fifth-generation Floridian. She will take over the position held by Republican Pam Bondi, who was barred from seeking re-election because of term limits. Florida voters have frozen the size of tax assessment increases on commercial, rental and other properties that don’t have a homestead exemption. Spano defeated Democrat Kristen Carlson in the 15th District, which includes Lakeland and some of Tampa’s eastern suburbs. The seat opened up when Republican incumbent Dennis Ross decided to retire. Florida voters have approved a measure that bans public officials from paid lobbying jobs for six years after they’ve completed service. Proponents say it is needed to stop the “revolving door” of elected officials who leave office and then go to work for the lobbying firms that once worked to persuade them. Voters on Tuesday approved Amendment 9, one of four measures that pulled together unrelated items. The amendment bans drilling for oil or natural gas in the state’s territorial waters. That has been a major concern of both environmentalists and tourism officials, who feared a spill could ruin beaches. Florida voters have stripped the state Legislature’s power to authorize most casino gambling. Opponents included some horse and dog track operators. They accused Disney and the Seminoles of not wanting competition for tourist dollars. They said the decision on whether to allow casinos should be left to each county’s voters. The state’s voters on Tuesday approved Amendment 13, which bans betting on greyhound races starting in 2021. The 11 tracks that still have the sport will be allowed to keep their more profitable poker rooms, simulcast betting and, in South Florida, slot machines. Proponents said racing is inherently cruel, pointing to the average of two deaths weekly from illness or injury among the state’s 8,000 racing dogs. The team’s official name is to be Club Internacional de Futbol Miami, or Inter Miami. In Congress, Mast has generally supported President Donald Trump’s policies and also worked on veterans’ issues. Diaz-Balart defeated Democrat Mary Barzee Flores on Tuesday in Florida’s 25th District, which includes western Miami suburbs and areas near Naples to the west. Gaetz defeated Democrat Jennifer Zimmerman on Tuesday in Florida’s 1st District, which stretches from Pensacola across much of the western Florida Panhandle. Zimmerman is a pediatrician who is originally from the Philippines. Automatically qualifying in Tuesday’s election to new two-year terms are Reps. Frederica Wilson of Miami-based District 24; Val Demings of Orlando-area District 10; Lois Frankel of Palm Beach County’s District 21; and Kathy Castor of District 14, in the Tampa area. Shalala defeated Republican former television journalist Maria Elvira Salazar on Tuesday in the Miami area’s 27th District. It’s the first foray into elective politics for the 77-year-old Shalala, who was President Bill Clinton’s secretary of Health and Human Services throughout the 1990s. Salazar is a 56-year-old Cuban-American. She had sought to capitalize on the district’s strong Hispanic presence and cast Shalala as past her prime. Kimaz is a business entrepreneur who also describes himself as a “holistic healer” on his campaign website. Soto defeated Republican challenger Wayne Liebnitzky in Tuesday’s vote for the seat in the 9th congressional district, which includes the central Florida cities of Kissimmee, St. Cloud and Winter Haven. Liebnitzky was also the GOP nominee in 2016. Voters on Tuesday handed Rutherford a second term representing the state’s 4th congressional district, which is centered in the Jacksonville area. Rutherford defeated Democrat Ges Selmont and two independents to retain his seat. Crist won a second term in Tuesday’s election by defeating Republican George Buck in the 13th congressional district, which includes the Tampa Bay cities of St. Petersburg and Clearwater. Posey defeated Democratic challenger Sanjay Patel in Tuesday’s election for a sixth term in the House. Posey represents Florida’s 8th congressional district, which includes the cities of Melbourne and Vero Beach. Patel’s website says he is a political activist who focuses on economic justice and fair wages, health care as a human right, and guaranteed public education for all Floridians. Yoho defeated Democratic challenger Yvonne Hayes Hinson for a fourth term representing Florida’s 3rd congressional district, which includes the cities of Gainesville and Ocala. Those backing Gillum, however, remained upbeat and continued to chant Gillum’s slogan “Bring it home” as the thunderstorm continued. Pasco County Elections Supervisor Brian Corley told the Tampa Bay Times on Tuesday that his office had received 75 complaints about the sign by midafternoon. He said that he asked the Grace of God Church in New Port Richey to take down the sign, but because it is not within 100 feet (30 meters) of the actual polling place he can’t force its removal. The Rev. Al Carlisle said he posted the sign because of the Democratic Party’s support of abortion and gay rights. He also said Democrats favor open borders, which he said contradicts God’s establishment of borders around the Garden of Eden. He said if people are offended by the sign, their problem is with God, not him. Alachua County Supervisor of Elections spokesman T.J. Pyche says electronic poll books were having intermittent issues on Tuesday, but they weren’t going down at an alarming rate. Officials say all 62 polling places in the county have paper backups available, so any voter whose registration is up to date should be able to vote as normal, even if the precinct is having trouble with the electronic poll books. Anyone whose registration wasn’t showing up properly needed to vote with a provisional ballot. A small crowd of supporters chanted, “We want Ron!” He shook hands and thanked supporters before he and his wife, holding their children Madison and Mason, went into the polling place. “I tried to look over to see what she was doing,” Gillum said of his wife while holding their 1-year-old son Davis. “I voted for you,” she replied. This year’s totals far exceed those of 2014 midterms, but are still short of the 6.6 million who voted ahead of Election Day in 2016. In 2014, Republicans edged Democrats in votes cast before Election Day, while Democrats led two years ago in the presidential election. Despite the edge from Democrats in 2016, President Donald Trump won Florida due to a surge of GOP voters on Election Day. Florida’s more than 13 million registered voters are choosing a new governor and voting on a pivotal U.S. Senate contest. Voters in Florida are electing a U.S. senator, a new governor and several new members of Congress while also deciding to whether approve 12 proposed changes to the state’s constitution. Polls opened Tuesday morning in Florida’s Eastern time zone and will open one hour later in the western portion of the Florida Panhandle, which is in the Central time zone. Polls close at 7 p.m. local time.